Isolated, the words all sound so cliché. Organic. Flowing. Curvy. But set to the backdrop of Chicago’s blocky skyline, they assemble a brash thesis on the city’s future: The new George Lucas Museum of Narrative Art is a low-slung knoll inside a landscape of towering Lego, an Egyptian pyramid reimagined for the year 2020. For those who missed the news, George Lucas is building—and paying for—a $300 million museum on Chicago’s lakefront. He hired some of the best architects in the world to design it. And it will be placed in one of the most prominent pieces of real estate in the city. Today, I sat down with the team—Ma Yansong, founder of MAD Architects, Angelo Garcia, President of Lucas Holdings, and Mike Toolis, CEO of VOA—who walked me through the early renderings you see here (and a small handful that they said weren’t finalized enough to share). “We want this building to be Chicago architecture for the future,” Ma says. Ironically, the building that he and Lucas would like to see redefine Chicago architecture was never meant for Chicago in the first place. That’s the short version. Here’s the longer one. George Lucas sold Star Wars. He fell in love with a Chicagoan, got married, had a child, and moved (part-time) to the city. At some point, he decided that he wanted to build a museum that could tell the history of narrative storytelling, all the way from cave paintings to lightsabers. It would feature an estimated $600 million in Lucas’s own artifacts, which have been privately stored at Skywalker ranch in Nicasio, California, ranging from original Norman Rockwell paintings to a full-sized Star Wars speeder. He really wanted to build it in Golden Gate National Park’s Presidio, in his home town of San Francisco. He mocked up a design that looked like a large estate house, meeting the area’s aesthetic requirements. But the Presidio Trust rejected his proposals without ever really explaining why. So he pitched Chicago instead, and Mayor Rahm Emanuel practically handed him the keys to the city. He secured 17 acres of the Museum Campus for $1 a year, a nearly free parcel of land a stone’s throw from the Shedd Aquarium, Adler Planetarium, the Museum of Natural History and, of course, Soldier Field, home of—because I’m an appeasing Chicagoan, I’ll say it for you—da Bears. Quite controversially, the museum will be placed on the asphalt parking lot where Bears fans tailgate. In short, there is no open parcel of land more academically and emotionally sacred than this in the city. With San Francisco’s restrictions lifted, however, Lucas was allowed to build something a lot more future-forward. So he hired an all-star team. 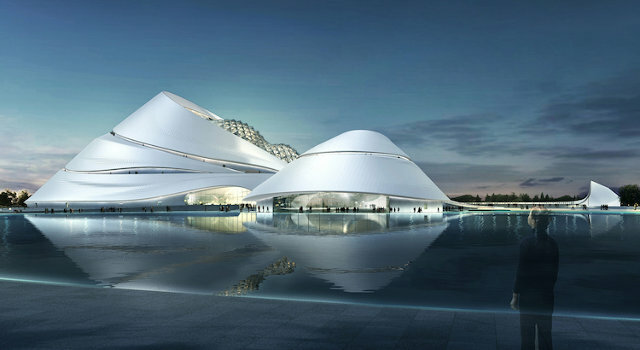 Beijing-based MAD Architects was brought on to design a building that, as Lucas put it, “pushes the envelope of 21st-century design.” To handle the landscaping and build a bridge to a nearby island, he hired the acclaimed Studio Gang, a rare, female-led architecture firm. And VOA Associates was brought in as the Chicago-based firm to manage the project. The design is nothing like the austere, skyscraping rectangles that Chicago is known for—and Ma says his “futurist, yet timeless” vision can bring the city’s architecture “to the next level”—a statement with enough gravitas that Chicago’s Burnham loyalists would probably be right to interpret it as a tad insulting. His vision is an organic structure that seems to grow straight from the lakefront soil. The walls are actually stacked stone blocks—like a pyramid, if the Egyptians had only learned to code, because an algorithm determines the stones’ shape. Every stone must have a very particular angle to fit into Ma’s giant, amorphous jigsaw puzzle. And to complete the Egyptian metaphor, visitors walking into the building enter a large, tomb-like atrium, with a single skylight shining in light from above. Stone was chosen for its longevity—the design team hopes the building will last 100 years—but stone is also good at retaining heat. The team thinks that lights and other equipment inside the building may generate so much heat that it will be unnecessary to heat the space during the winter—even with relentless winds blowing in from the lake. On the roof floats a metal halo, connected to the base by three pillars, including a central, reinforced elevator shaft that functions like the fulcrum of a child’s angel costume. Visitors can walk around the halo to enjoy 360-degree panoramas of the city and lake. Just below, on the museum’s roof, visitors can enjoy similar views and a restaurant. Much of the design was developed with the public in mind. The halo, the rooftop, and even a second-story lakeside walkway are all open to the public to visit free of charge. Bears fans who’ve lost their blessed tailgating space will even be able to park in the museum’s grass park area, landscaped by Studio Gang, to drink and BBQ. It’s all a nod to the history of the area—within the city limits, the lakefront protects public access, even amid development. For all Ma’s celebration of outdoor space—the design includes an open-air lake-facing amphitheater—the museum itself has almost no windows within its pyramid. That central structure will include several exhibit rooms, four different theaters, and a basement archive. Blocking sunlight is crucial to protecting the exhibits and making digital content plenty visible to visitors. How will Chicago will react to the design? Chicagoans are famously prickly about their buildings. The Lucas museum’s future neighbor, Soldier Field, had an avant-garde renovation that was notoriously shunned by city residents. Donald Trump’s Trump Tower hasn’t fared much better. The George Lucas Museum of Narrative Art is currently being fleshed out from the concepts you see here to schematics. It’s slated for completion in mid-2019. Correction: An earlier version of this post had written “Soldier’s” Field in one spot rather than “Soldier” Field.